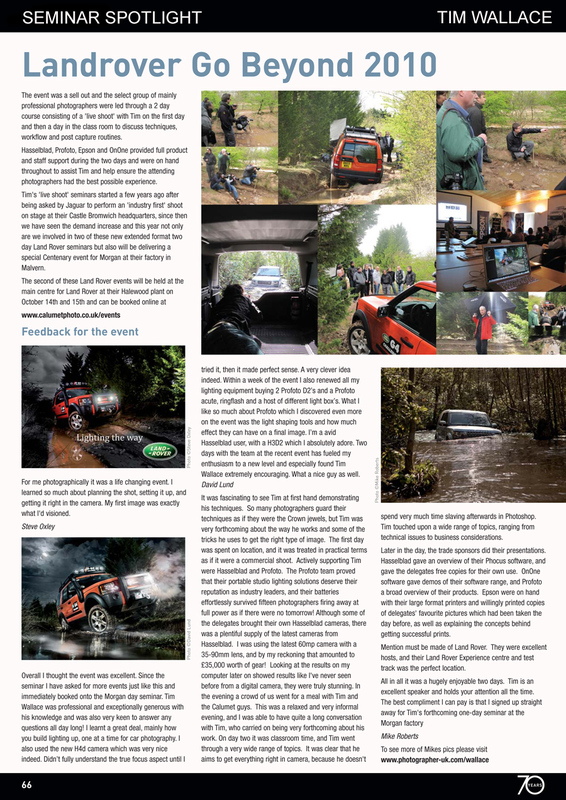 Calumet Focus Magazine this month featured the 'Live Shoot' car photography seminar from Land Rover in their Seminar Spotlight feature. 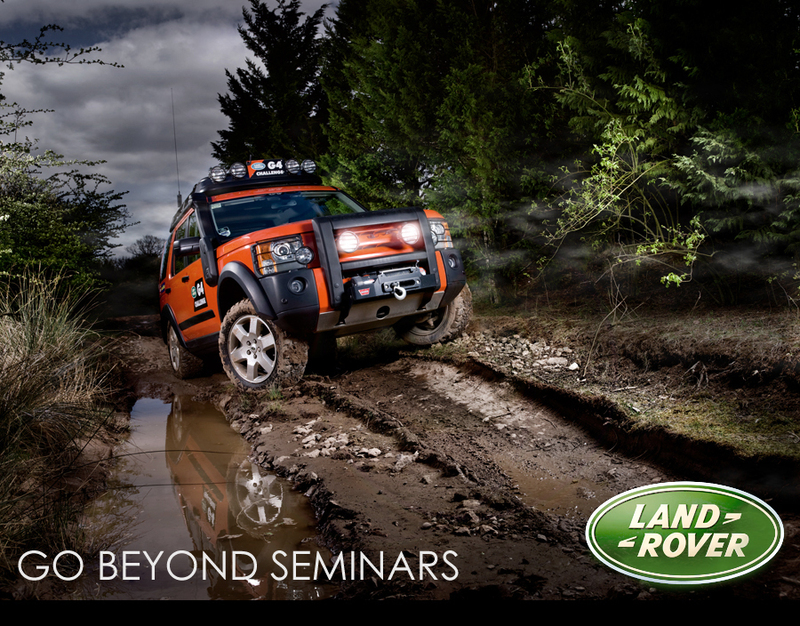 The seminar is one of two that car photographer Tim Wallace is holding this year for Land Rover at their main centres in Solihul and Halewood. This first event was the largest that Calumet had ever been involved with and it took place at the Land Rover plant in Birmingham. The event was a sell out and the select group of mainly professional photographers were led through a 2 day course consisting of a 'live shoot' with UK Car and Commercial Photographer Tim Wallace on the first day and then a day in the class room to discuss techniques, workflow and post capture routines. Hasselblad, Profoto, Epson and OnOne provided full product and staff support during the two days and were on hand throughout to assist Tim and help ensure the the attending photographers had the best possible experience. Tim's 'live shoot' seminars started a few years ago after being asked by Jaguar to perform an 'industry first' shoot on stage at their Castle Bromwich headquarters, since then we have seen the demand increase and this year not only are we involved in 2 of these new extended format 2 days Land Rover seminars but also will be delivering a special Centenary event for Morgan at their factory in Malvern which very rapidly sold out. Tim - "This year I wanted to extend the format on our Land Rover events as I felt that photographers still had many questions once the live shoot was completed so we decided to extend this year to a 2 day platform. 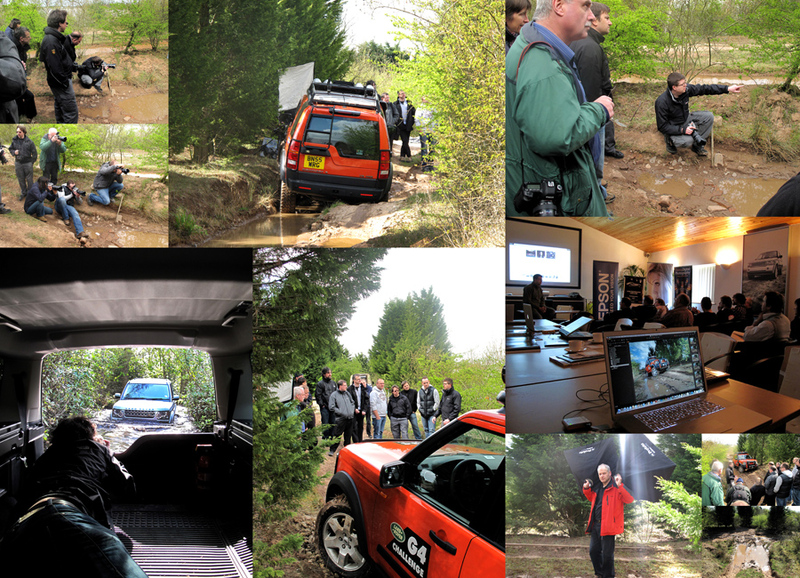 It's a pretty intense few days for everybody including me in truth but the feed back that we have received from this first event on the new platform is very positive indeed and I'm looking forward to us enjoying more success working with Land Rover. Our next Land Rover event will be later this year on October 14th and 15th and will be held at the Halewood plant near Liverpool. It's been a great 2 days and the support that I receive from our suppliers such as Hassleblad and Profoto really makes for a great experience for all those that attend, this time we had the new Hasselblad H4 for people to use doing the 1st day shooting out in the field as well as the latest lightweight field lighting solutions from the Profoto team." Really really grateful for 2 days. For me photographically it's a life-changing event, no question. I learned so much. Hope to see you at future events. Tim hi, wanted to say thank you for your time over the last couple of days, very much appreciated and hugely valued. I'm sure everyone feels the same and I know I learnt a great deal and would leap at any opportunities to do something similar again. I just wanted to drop you an email to say a huge thank you for a truly fantastic couple of days shooting and editing with you. The course exceeded my every expectation and not wanting to entirely blow smoke up the proverbial was truly inspirational! I'm already feverishly examining ever car I see thinking about light bouncing of angles and shapes, my girlfriend has had the tour of your site including lengthy explanations about the lack of photoshop!! A combination of elements that you focused on have really resonated with me, control , precision , accuracy and skill all at camera level, something finally clicked and with out a shadow of a doubt car photography is the area I want to develop and hone my skills at. I feel genuinely reinvigorated toward the craft!